La Cashina (Cascina) translated in Italian means "the farmhouse" and within the kitchen of that farmhouse is where the foundation of the restaurant's authentic Italian cuisine all began. Frank and Marie Chilelli came to America from southern Italy and brought with them many of the traditional recipes that can be seen on their menu today. Together with their son Domenick and his wife Diana, they have successfully owned many Italian restaurants throughout the New York and New Jersey area for over forty years. The Chilelli family's passion for creating a truly memorable dining experience led them to acquire a building at 53 State Highway 34 Marlboro, New Jersey in 1994. Little did they know that over the course of twenty years this building would flourish into the highly awarded and recognized La Cashina Ristorante. As a family, they have worked hard to infuse old world recipes with a modern flare. What started with a desire to establish a small family owned business has grown into a restaurant that has given the Chilelli family a reputation for serving outstanding authentic Italian cuisine, generous portions, fair pricing, and top notch service. They are hands-on owners who will greet you at the door and come over to the table to say hello. The family ensures that the dining room, with its dimly lit lighting and soft background music, exudes a very comfortable and intimate atmosphere as if their customers are visiting their home instead of their restaurant. And just as visitors in their home, each person that walks through the doors will be treated with the utmost respect and hospitality. 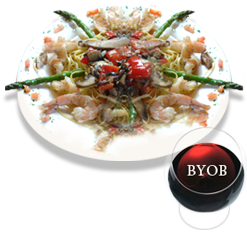 The restaurant offers lunch, dinner, takeout, catering services, and gift certificates. They specialize in parties for all occasions, so come in to book your next special event with them. Please note that all dishes are made to order, so please be patient and enjoy. Some of the benefits of dining at La Cashina include being able to bring in your own bottle of wine, free Wi-Fi, and if you sign up with them using your email, you will receive special promotions as well as be entered into a monthly drawing to win a free dinner. The rest is up for you to discover, so come on in to see what everyone is talking about. La Cashina would like to take this opportunity to thank its loyal patrons and newcomers for their continued support and extraordinary praises. In addition, once a month we'll pick one winner from every entry submitted and give away a free dinner.